The Disney Dream Store at this year’s D23 Expo is the spot to find Disney Parks apparel, art, collectibles, and hats. This year the Dream Store will feature a specially designed ear hat that was made just for the D23 Expo. Other new hats at the Dream Store include ear hats with interchangeable bows. The Interchangeable Bow Collection will debut at the Disney Parks this fall, but D23 Expo attendees will have a chance to see the collection first. The collection starts with a mouse-eared headband that comes with a removable bow. The headband has three spaces where interchangeable bows can be added. 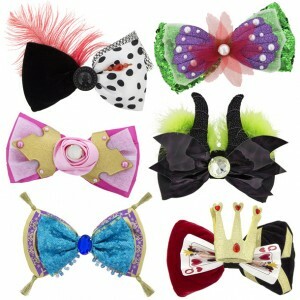 At the Expo guests will also find six interchangeable bows for the headband. In all there will be 10 bows available when the collection debuts this fall. Another hat that will be available at the Expo is a leather hat celebrating the 50th anniversary of Pirates of the Caribbean (the attraction0. The hat comes in a treasure box and contains a pirate-themed metal medallion. There are only 230 of these hats available for purchase at the Disney Dream Store.